Whitehorse senior Rapaela Filfred, center, kills the ball over Zuni’s Tsattie Shayla (10) during the Bloomfield Invitational Volleyball Tournament held on Sept. 19-20 at Bloomfield High School. After spending three seasons gaining experience, the Whitehorse volleyball team is ready to put it to use. With five seniors leading the team, the Lady Raiders are preparing for their third state tournament appearance in four years. And they started at the Bloomfield Volleyball Invitational. Whitehorse finished in second place at the invite held Sept. 19-20, after losing 3-0 (25-20, 25-11, 25-20) to Kirtland Central in the championship match. 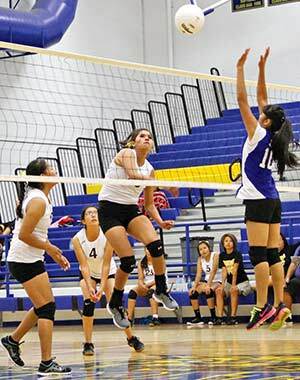 Whitehorse head volleyball coach Sheryl Baldwin said the team focused on improvement and working on the things that will help them in the long run. “Communication is the key here,” she said. “We’re trying to have the seniors especially step up because they’ve had the experience. I’ve seen that improvement every game we’ve played so far." Baldwin said the five seniors played together since they were freshmen but found it difficult to stay on the same page. She said things were already starting to turn around during the tournament.